On Automatic equipped vehicles; due to use of an oversize driveshaft from the factory and inadequate factory clearance it may be possible for the front driveshaft to come in contact with the automatic transmission pan tearing the factory boot and rubbing on the shaft. Generally this occurs during heavy articulation when front sway bar links are disconnected and longer shocks are installed. If this is found to occur, the proper procedure would be to replace the oversize factory shaft with an aftermarket smaller diameter shaft to increase clearance between the transmission and front driveshaft. Rough Country does offer this driveshaft if needed. Front: Lifted coil springs, upper and lower adjustable control arms with X-Flex joints, adjustable track bar, quick disconnects, shock relocation brackets and stainless steel brake lines. Rear: Lifted coils springs, coil correction plates, upper and lower adjustable control arms with X-Flex joints, track bar drop bracket, sway bar links, and stainless steel brake lines. 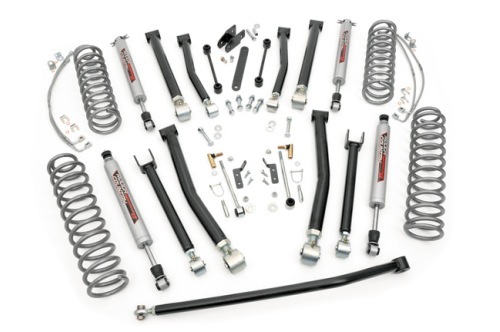 Shocks: (4) Premium N3 series shocks. 2012+ models require exhaust modification to clear front driveshaft. Coil correction plates corrects the rear coil angle 10 degrees. Coil correction plates allows the rear coil springs to function more effeciently. Application valved Performance 2.2 series shocks. Unique coil springs for 4-door & 2-door models. Wheel Backspacing: 4.5" - 4.75"